New Jersey couldn’t rightfully claim the title of “Garden State” without being a leader in new trends, and the 2013 garden season is no different. This year the trends are the three S’s, Sensory, Self-Sufficiency and Sustainability. NJ landscaping professionals are noticing distinctive trends away from planting purely for aesthetics and toward planting for purpose. Sensory Gardens For families with school-age children, sensory gardens are a huge trend. These gardens explode with colors, smells, textures, tastes and sounds. The entire purpose behind a sensory design is to stimulate the senses. Plants native to the NJ tri-state area are chosen for everything from their foliage and flowers to the types of wildlife that they attract. Bird baths, sculptures, fencing and water elements can all be used to add a hardscape contrast to the lush greenery. Self-Sufficient Living Homestead landscaping is also catching on like wildfire everywhere from rural homes to the window gardens of apartment complexes. People are looking to become more self-sufficient and growing their own food is just one of the ways they are doing it. Square foot gardens and high-yield vegetables are finding their way into spaces traditionally reserved for annuals. They are even showing up as accent plants in the perennial bed. Tomatoes and peppers are the favorites for accentuating flower gardens, while beans and peas are becoming decorative foils for picket fences and shed perimeters. Homeowners that don’t have extensive knowledge in home gardening can tap the knowledge base of a local landscaper in the New Jersey tri-state area to help them set up and maintain Such a garden. 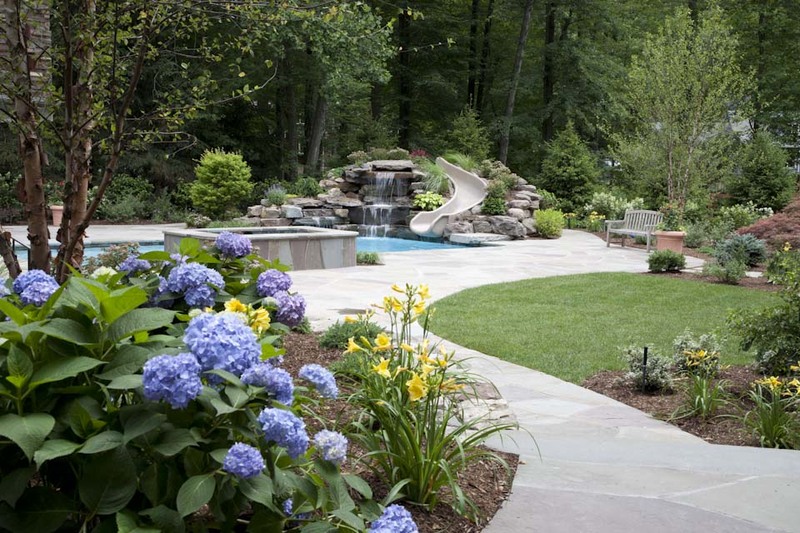 Sustainability in Landscaping Another major trend for landscaping in New Jersey in 2013 is adding more perennial flowers and hardy bushes to the landscape and reducing the amount of lawn. This move reduces the amount of work that needs to be done mowing and the amount of water that is used irrigating the land. Readily reseeding annuals like Marigolds and Asters are being planted with other traditional wildflower and heirloom seeds to eliminate the need to purchase and plant specimen annuals every year. This low-maintenance planting choice will allow Tri-State homeowners to spend less time working in the yard and more time enjoying it. If you are looking for a way to liven up your landscaping this year, find a landscaping company that can help you place the three S’s in your yard to liven up the surroundings. Thomas Flint Landscape Design & Development is a Ramsey, New Jersey landscape company that specializes in landscape design, planting, outdoor lighting, paver patios and walkways, outdoor fireplaces, custom swimming pools, pool renovations, and more for people in the New Jersey tri-state area, including New York and Connecticut.